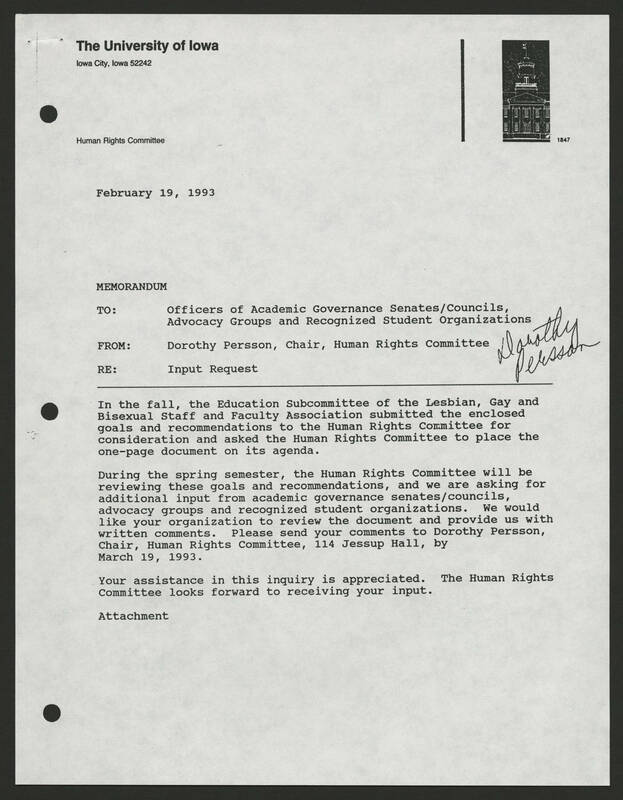 The University of Iowa Iowa City, Iowa 52242 Human Rights Committee 1847 February 19, 1993 MEMORANDUM TO: Officers of Academic Governance Senates/Councils, Advocacy Groups and Recognized Student Organizations. FROM: Dorothy Persson, Chair, Human Rights Committee, Dorothy Persson RE; Input Request In the fall, the Education Subcommittee of the Lesbian, Gay and Bisexual Staff and Faculty Association submitted the enclosed goals and recommendations to the Human Rights Committee for consideration and asked the Human Rights Committee to place the one-page document on its agenda. During the spring semester, the Human Rights Committee will be reviewing these goals and recommendations, and we are asking for additional input from academic governance senates/councils, advocacy groups and recognized student organizations. We would like your organization to review the document and provide us with written comments. Please send your comments to Dorothy Persson, Chair, Human Rights Committee, 114 Jessup Hall, by March 19, 1993. Your assistance in this inquiry is appreciated. The Human Rights Committee looks forward to receiving your input. Attachment.